Home brownout car electric supply experience flood flooded area generator Office ondoy storm Stormy Story tower typhoon One Devastating Stormy Day! 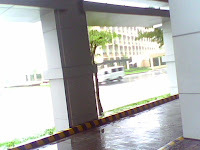 It was a six-hour typhoon last Saturday, September 26, 2009! We are still in our office for an overtime to beat the deadlines for our current project. 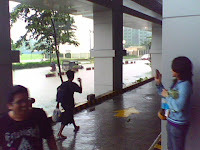 Until finally we realized, we caught at the dead line by the storm named "Ondoy"! I thought it's just an ordinary storm. I couldn't imagine how strong it was since we are in an enclose tower! But then, we felt its strength as our electric supply turned down. Yeah, no electricity! Our office lights turned-off! It was a partial dark moment in our office. The only lights that illuminated us were the red lights of emergency flash bulbs and the lights coming from our computers and software machines! At first we thought we could work on a dim light, but eventually we were then instructed to hold-off all our works! We need to conserve power supplies. We were instructed to shut down all our machines. 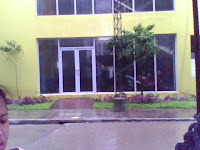 I wonder why our new building doesn't have a generator to sustain electric supplies! Well, let's understand then that since our building was newly constructed, everything was under test! 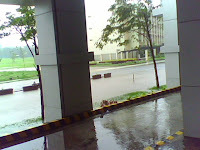 Thanks God, our company have a relief goods for all its employees trapped in a calamity situation. Before going home, we were ask to eat lunch (since it was already 12 noon)! Luncheon meat, canned sisig, lechon paksiw, rice and other canned goods satisfied our hungry stomach! Now it's time to go home! We need to leave our office. 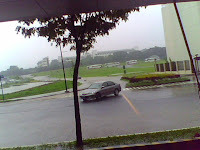 Thanks God, we have a warm-hearted officemate that will take us home with his brand new car! 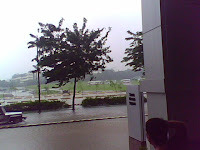 Wind, Flood, and Rain...A Love Triangle! Hope I Have a Car In a Stormy Day! Our straggle didn't end here! Actually it was just a start. Oh my...our elevator was not functioning since there was no electric supply! What does it mean? Well we need to take the stairs! With flash light together with my other officemates, we go down the stairs! From 15TH Floor downward, we used the stairs! Imagine how high was that. But not only the height that served the limiting factor. The total darkness in the stairs (with only a little bit of light from the flash light which guided our way down) threatened our path! 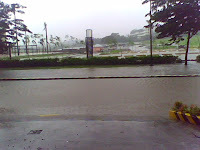 Still Flooded In front of the Car Park! 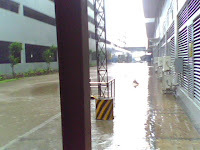 Wet, Flooded, and Slippery Floor! Imagine How My Area Looks Without Light! It was the cheapest exercise we all undergone. At last, we were finally on the ground floor! It was a breath-taking experience we ever had! 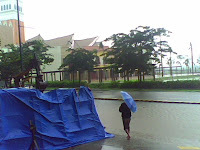 The strong wind with very hard rain falls welcomed us down! 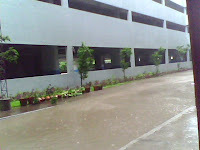 We eventually go to the car park to locate my officemate's car which will take us to our own homes! Different flooded roads were all-around the streets! 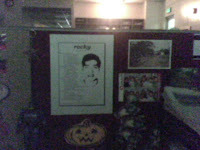 Thanks to my officemate's car! 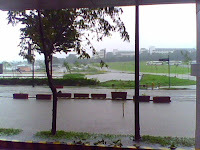 It saved us from the cold brutal typhoon and flood on our way going to MRT station! Ooopps...if you think this ended my stormy story, well you're definitely wrong 'cause I faced another challenging experience! This time in the bus and right after we ride off on my officemate's car!